This theme was originally the new design for our Southern Highlands site, but then something happened! Yes, it seemed a site had just popped up that used a similar colour scheme, and tulips for their header image. That site has since disappeared (or at least we can’t find it), but rather than waste a template we did think looked kinda fun, we converted it to a WordPress theme. It was our introduction to creating WordPress themes, and it was kinda cool watching people turn the template into their own! 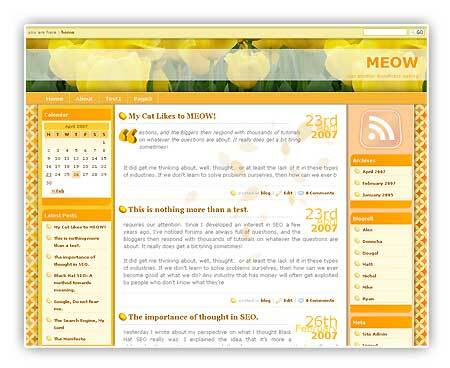 You can download the WordPress Tulip Time theme here. You can also view it in action here. This entry was posted on April 26th, 2007 at 1:42 pm and is filed under Theme. Thanks for very powerfull design. I hav some trouble with the Adsense areas. The adds are consistent in themes but aren’t relevant to my site. Exept for the ”Om” page. Seems like Google aren’t reading from the pages but from somewhere ? Love the skin, but want to know if there is a (simple) way to rid the sidebars of bullets. Thanks! The above apparently can increase the relevancy of the ads. Hopefully that’ll help a bit. To get rid of the sidebar bullets, you’ll need to edit the style.css file. If you go down towards the bottom of the file, and look for the Portlet section, it’ll be in that block. it should remove the sun bullet, as well as the padding that shifts the bit over a bit. Hopefully that should do the trick. thank you for sharing your beautiful and bright template. i love it very much. but i do want to change the fluid width to a fixed width, will that be possible? i tried to look for the code and changed a few times, it didn’t work. any help will be great. many thanks again. i also mailed you privately nevertheless i wish to also ask how could “Just another WordPress weblog” be replaces or removed from the header. I looked and found no way to do so. Hi, thank you for the template and its energetic colour scheme! Love the bullets :) I just downloaded it for my webpage, and it appears to function fine. There are some problems with the upper bar, but that seems to be a general WordPress problem. I solved it by using less child pages. The only thing I’m still thinking of changing are the tulips… They suit springtime better. A sunrise or such would be nice. Oh, and my pages were updated to the latest WordPress vs, the sun bullets show an extra bullet above the titles. It appears as if it read my pages, posts, and links as childpages to a non-existing parent. How can I solve this? Thanks! – I want to add a list of recently commented to the sidebar – is there a ay to do this using your existing code? – is there a way to place an image within the ‘listheader’ portlets in the sidebars? Love your tulip time theme which I am using for my blog. A couple of questions… When you view a post, the tagline in the header changes to post title. Is there a way to change this? Also, The background image on centre column at top overlaps right hand column when screen is not at it’s largest. Is there a way to take this image out altogether?